Gold Products and Coins - Gold bullion coins and bars, Numismatic Gold Coins (US & Foreign), and Most Gold Scrap (old or broken jewelry, dental gold). Silver Products and Coins - Silver Bullion Coins & Bars, Numismatic Silver Coins (US & Foreign), Most Silver Scrap (Broken or nice Jewelry, Flatware & Coffee/Tea Services). 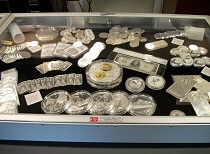 Platimum & Palladium - Coins & Bars, Numismatic Platinum & Palladium Coins (US & Foreign). Collector Coins - US Coins (all dates), Foreign Coins (most dates). Collector Currency - US Currency (all dates), Foreign Currency (most dates). Stamps - While the stamp market has diminished substantially we are still active buyers of rare U.S. stamps. We also purchase “face” postage such as mint sheets, booklets, plate blocks, etc. Centralia Coin, Stamp, Etc. will purchase your rare U.S. or Foreign Coins or Currency. You can bring your collection into our stores, or phone us to determine if your coin collection is valuable. We look forward to dicussing your options with you. We recommend that you bring your gold, silver, platinum or Palladium items in to our store. We then either pay you right there on the spot or you may wish to keep some or all of it. We tell you the price free of charge regardless if you sell or not.